The only prerequisite for making your own Lara bars is a food processor or high-powered blender. If you only have a rather basic blender, it might be worth a short but the more room there is around the blades, the higher your chances of success. In terms of ingredients, this process is pretty straightforward. So easy, in fact, that I frequently wonder why I’m not making them once a week! Dates are the main ingredient because they produce a thick, sweet paste during processing. Thus they act as an adhesive to give fruit bars their unique consistency. 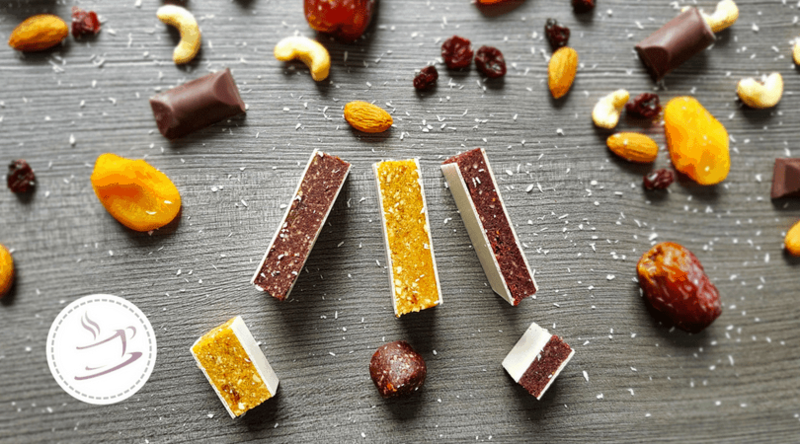 In addition to dates, nuts add the second pillar of a good fruit bar. They add a bit of crunch and nicely counter the otherwise overwhelming sweetness of the dates. 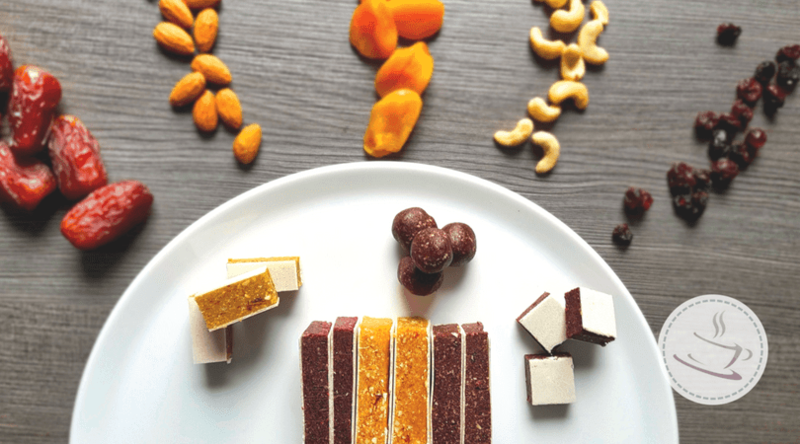 Cashews are very popular because of their neutral taste, but any other nuts you enjoy can be substituted to craft your very own fruit bar flavor. 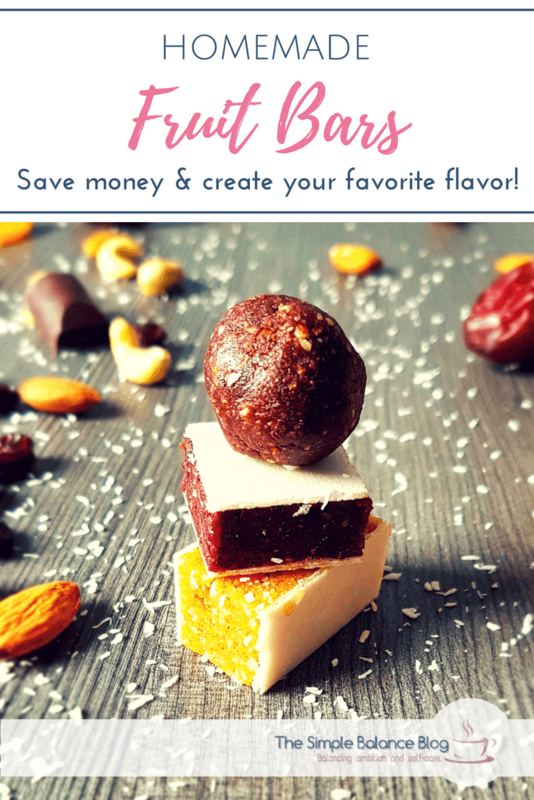 The third component is the flavoring part which is where you can go wild – or clean out your pantry shelves… Any kind of dried fruit, seeds, chocolate chips or freeze-dried berries add tons of flavor. Coconut flakes are great for adding volume when only a few flavoring ingredients are used. For even more of a personal touch, consider adding baking cocoa, vanilla, cinnamon, lemon juice or instant espresso. And don’t forget about the chance to add even more nutrients that may not come in a tasty package. When making these for my kids, I love adding a scoop of smoothie powder, whether it be green, yellow or red. You know, the kind that has nothing but freeze-dried greens, berries and fruits in them? They work great as additional nutrient boosts without overpowering the taste of the fruit bars. For easy reference, simply stick to this rule: All three components – dates, nuts, and flavoring – are used in equal parts. Once you got past the agonizing part of choosing your ingredients, it’s only a matter of throwing them into your food processor and let it do its magic. I found it works best if nuts are the first thing added to the bowl of the food processor because they keep the mixture from sticking to the knives. The goal is for the mixture to sticks together when pressed between your fingers, but not be soggy or gooey. If it’s too crumbly, adding just one or two extra dates and a few more rounds in the food processor will usually do the trick. If you end up with a sticky mess on your hands, add a tablespoon of coconut flakes, oat flour or ground nuts. Next, cover the inside of a small casserole dish or baking sheet with plenty of cling film. Make sure there is plenty of extra on each side it can be folded back later. Fill in the mixture, using your fingers to distribute evenly and cover it with the cling film. Using a measuring cup, press the mixture further into the dish, compacting it and leaving a smooth surface. An hour in the refrigerator helps to make cutting easier but you can get away without it. Finally, unwrap the top layer of cling film and pull the entire block from the dish, using the long sides as a handle. If you used a baking sheet, simply put a cutting board over it and turn it around. Having removed the rest of the cling film, they can be cut into bars whichever size you like. In Germany, most commercial fruit bars come between two layers of edible rice paper. They make them even easier to handle and nicely portable. If you’d like to try this, get edible rice paper sheets from a baking supply store and use them to cover the top, cutting the rice sheets to fit. Then turn it out onto the cutting board, rice paper side down and cover the second side, pressing gently to make the sheets stick. Now cut the bars into any size you like. You can create a very cute version by using round edible rice paper discs (about 2 inch diameter). Instead of pressing the mixture into a large flat dish, simply scoop little mounds onto each disc, using an ice cream scoop. With a second disc, gently press the mixture between both rice paper discs to distribute evenly. Sort of like putting a scoop of ice cream between two cookies. If you don’t shy away from a little more effort, form the mixture into little balls. Due to the extra pressure from the outside, even slightly crumblier mixtures hold their shape well. And kids love them! #1 Schedule some time with a friend to make a large batch together. You get to hang out and chat and at the same time you’ll both end up with a stack of delicious fruit bars. #2 Ask your husband, in-laws or a friend to watch the kids for an hour and listen to an audiobook or podcast while preparing these. 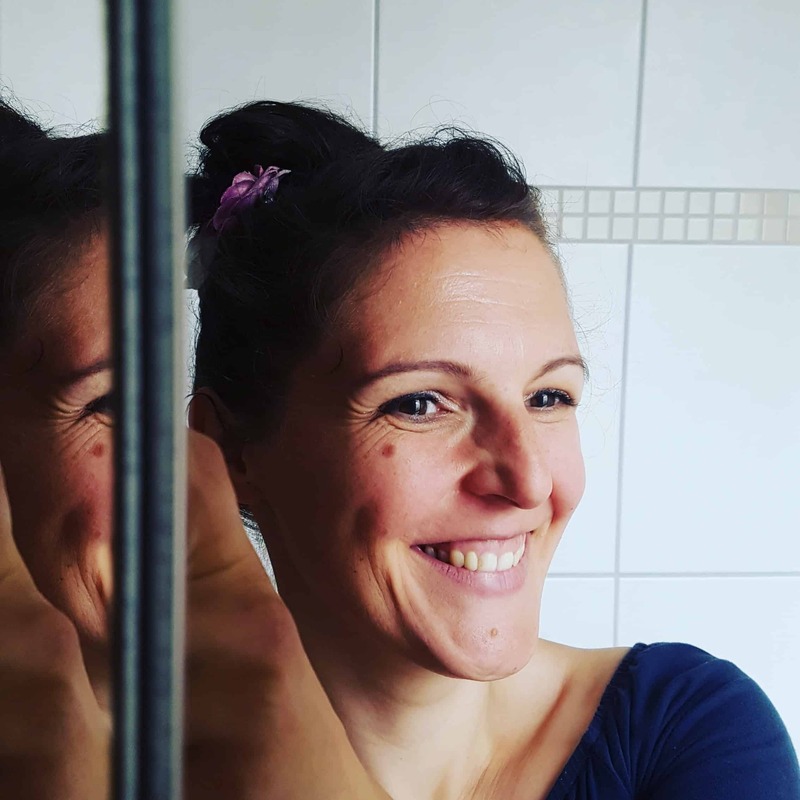 You might even get to empty the dishwasher or enjoy a quiet cup of tea in the process. #3 Go for the easiest preparation method: No rolling into cute ball-sized bites, no rice paper – just press into a large square and cut. Leave fancy for when you have the energy to do so. #4 If none of the above are an option, check out your supermarket’s own brand snacks. They are usually much cheaper than popular brands. Look for those that have ingredients you would use at home, preferably without flavoring. These make still great snacks for your family, even if you spend a little more than ingredients would cost. Your time is worth money, too! But if you feel excited to try something new, then go ahead and collect your ingredients! 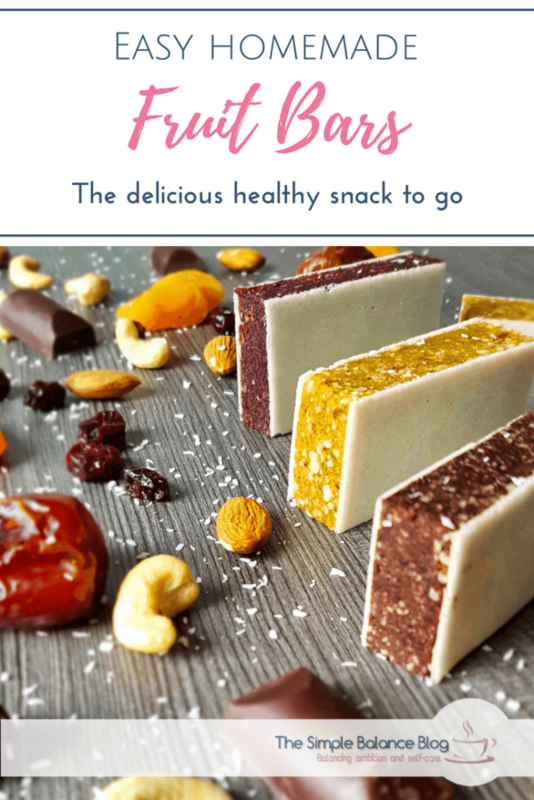 Get inspired by my three most popular varieties and start creating your own fruit bar creations. Your wallet, your children – and even your stomach on a super busy day – will thank you! 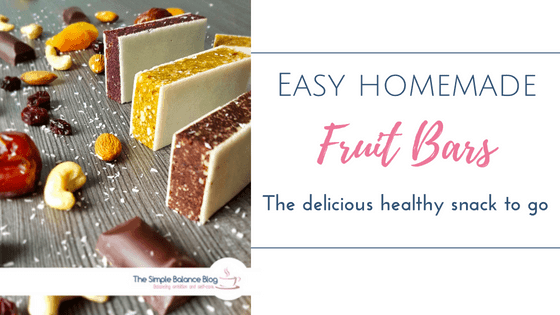 With just a few ingredients you can quickly recreate these delicious fruit bars - with or without a wafer! Put all ingredients for the respective variant into the food processor and blend for 1-2 minutes (or longer, depending on the device) to a moist, crumbly mass that sticks when under pressure. Line a small casserole dish generously with cling film, leaving enough on the sides to later cover the top. Fill the mixture into the dish and, using your fingers, press it down. Fold over the overhanging film and press it down firmly, this time using a measuring cup. Optionally place in the refrigerator for one hour for easy cutting. Remove the cling film from the surface and cover with rice paper sheets, if desired. Turn onto a chopping board, cover the second side with rice paper and cut into bars. Enjoy! The bars can be kept at room temperature for at least one week, and considerably longer in the refrigerator.